Best Soundproof Curtains Reviewed – Sound Pollution or Noise pollution is a serious thing. I am a victim of this problem. I am from New York City. NYC is like Hub in the country right now. It’s more of a happening place in the States. Because of all the craze, the city has a lot more drawbacks too such as Traffic. NYC is known for its traffic in North America. With that insane traffic comes the noise so I had to live with that problem for a lot of years. I only realized that I could control and stop this noise from entering my apartment a couple years ago. I had a home office so my productivity was really damaged because of sound pollution. I then read a lot about Soundproof or Soundproofing the apartment, did dozens of research and then finally now my apartment is completely soundproof. I had to buy more than 15 Soundproof Curtains and review them to come up with this article. 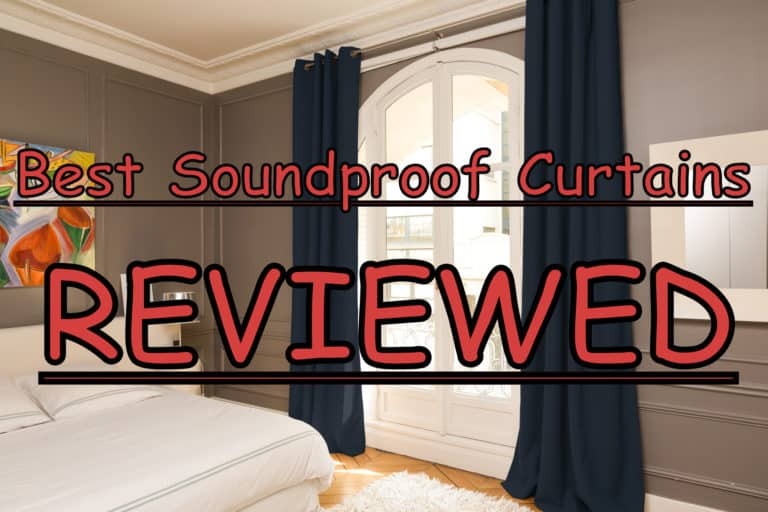 I have reviewed and found the 10 Best Soundproof Curtain for your house, office and more. NICETOWN is the Best curtain brand in the whole world. This is the brand that revolutionized the curtain industry with more specific features that would take the simple wall curtains into something really special. One such feature is Double-layered Curtains which is lined behind one. This soundproof curtain is honestly the best one you can buy and will definitely be worth your money. This soundproofing curtain comes with seven colors which are Cream Beige, Grey, Pure White, Brown, Navy Blue, Taupe, Black (One Layer). It also comes with more of a gradient color, more like multiple colors such as Platinum and Taupe, Taupe and Beige. 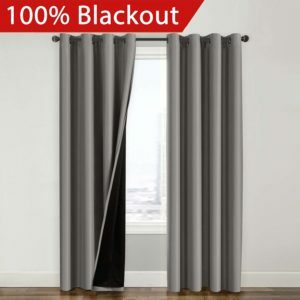 This curtain not only specializes with the soundproof feature but also it promises 100% Blackout, which means it blocks the outside light from entering through the window which is great for some people. When I was using this curtain I almost never heard a little of noise too its that good. The soundproofing capabilities in this curtain come from the amazing material this curtain is made up of. It is made up of 100% Polyester which is far more superior material than cotton or any of its kind. The curtain is really thick and not so heavy. the thickness of this curtain helps in preventing the outside pollution entering the house. If you order, the package comes with 2 panels. Each Lined Curtain measures 52″ wide x 63″ long (Total width is 104″) and it’s really easy to install. Nicetown is known for manufacturing designer curtains so you need not worry that you might end up getting plain or ugly curtains. These curtains are unique in terms of design and also Eco-Friendly. This Premium Soundproof and Blackout Curtains from H.Versailtex is the second recommended best soundproof curtain by BuyersGuideX. H.Vesailtex Blackout curtains come with eight different colors and shades such as Burgundy, Charcoal Gray, Dove Gray, Navy Blue, Orange Ochre, Plum Purple, Sage and Stone Blue. The picture that is used is Plum Purple. The material that is used to make this Soundproof curtain is Microfiber Polyester. Not a normal polyester but microfibers of that material. By using the microfiber of the particular material the finished product has tons of benefits such as Lightweight, More Soundproof and More Volume. The size of this curtain is Large and sold with only one panel which is more than sufficient. 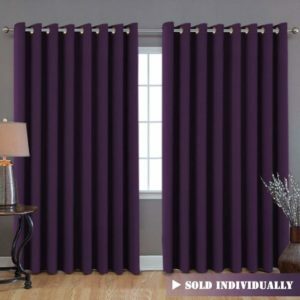 This curtain is completely 100% Blackout curtains which means it prevents the sunlight or the pollutant light or UV rays from entering the house. It is also mentioned that it prevents 100% UV Rays which is amazing with the kind of climate change that we are in. If you are concerned about the environment it is complete Eco-Friendly, vinyl and PVC free so it’s completely safe for the room. The quality of this soundproof curtain is really amazing with huge standard maintained. It is soft, smooth, silky material which really feels elegant and classic. One more feature of this curtain that I forgot to mention is that it is thermally insulated on the inside which is really good in this price range. Sold only with Single Panel. Another NICETOWN Soundproof curtain in the top 3, that definitely tell us how good the company and their product is. This is a NICETOWN Soundproof curtain for Bedroom, but it doesn’t mean that it can only be used in the bedroom it can be used in any room. This curtain is again made up of polyester with three pass microfiber, which is incredible for preventing sound from entering through it. This curtain not only soundproof but 100% blackout curtain and UV ray protective in place. The Curtain measures 52″ wide x 84″ long. This curtain comes with 16 different variants and choices such as Grey, Burgundy Red, Cappuccino, Cream Beige, Black, Greyish White, Navy Blue, Toffee Brown, Turquoise, White, Semi-Sheer Curtains, Olive, Royal Purple, Baby Pink, Blue, Fresh Green and Pure White. That is a lot of choices to choose from. This again double layered so it provides complete protection in terms of Soundproofing, Sunlight, and Privacy from outside. Honestly speaking this is the best soundproofing curtain for this budget. Too many light shades, but decent blocking. Again another H.VERSAILTEX product in the top 4, which evidently proves that the company is really good and quality. 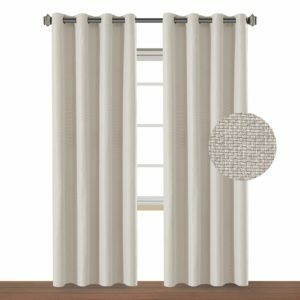 This curtain is Sold per single panel in package, panel measures 52 inches wide by 108 inches long, each faux linen curtain panel has 8 gorgeous copper metal grommets, the inner rim of the grommet is 1 5/8 inch which fit the rod up to 1 1/2 inch, slides smoothly back and forth. The material used in this soundproofing curtain is quite unique. It is made up of Faux Linen Blackout Fabric. Which means it provides 100% blackout better than any of the above-mentioned curtain too. 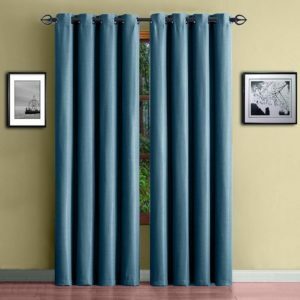 If you need a good soundproofing curtain also need to stop the sunlight or need complete privacy then you can purchase this curtain. It is very cost effective, cheaper than the above-mentioned curtains. This curtain comes with 13 different color variants such as Aegean Blue, Beige, Charcoal Gray, Cocoa Brown, Elegant Beige, Greyish White, Ivory, Prairie Sand, Pure White, Tan, True Ivory, and the classic white. As this curtain is made up Faux Linen Blackout fabric you will have 100% block from sunlight or other lightings. But it can stop 80% of the UV Rays. That is the only reason that it is ranked in 4th place. Other than that this is perfect and worthy for that price range. This curtain is also thermally insulated which means it is energy efficient too. Efficiently prevents cold or heat transfer from outside blocks drafts in cold months and keeps warm air out in the summer. Finally a Soundproof curtain from another brand, other than H.VERSAILTEX or NICETOWN. This soundproof curtain is from Deconovo, which fairly a good company with good quality products. This curtain comes with 27 different color variants such as Red, Beige, Black, Brown, Chocolate, Dark Blue, Dark Grey, Fuchsia, Fuchsia Pink, Grass Green, Grayish White, Khaki, Lavender, Light Beige, Light Grey, Lime Green, Maroon Red, Navy Blue, Nile Green, Orange Red, Pink, Platinum, Rose, Royal Blue, Teal, Turquoise and Super Pink. This curtain is made up of 100% Polyester which is good. This curtain is also thermal insulated and prevent heat escapes and blocks sunlight from entering the room, so that would help you save on energy expenses. The material of this curtain is really soft and smooth. The amount of color variants available in the curtain is really overwhelming to choose. This curtain can be washing using the washing machine which is a good feature because most of the curtains are not washing machine compatible. This is another soundproof curtain from a whole different brand called Sideli. This is a really good light blackout curtain but not that good in preventing the sound. It is still called Soundproofing curtain but it certainly didn’t block 100% of the sound or noise. 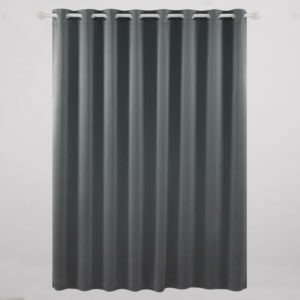 Sideli Solid Matt curtain comes in various color variants such as Royal Blue, Black, Blue, Coffee, Gray, Green, Navy Blue, Orange, Purple, Red, Wine Red, Pocket Black, Pocket Blue, Pocket Coffee, Pocket Gray and much more. This curtain is made up of valet kind of material but not exactly velvet. It is really super soft with a good matt finish and looks really luxury. The package includes 1 piece 52Wx63L inch panel, Each panel has 1 pc tieback. Sodeli solid rod is machine washable. Can be washed with both Hot and Cold water, but make sure that its gentle with non-chlorine or bleach water. This curtain can be used in sitting room, bedroom, dining room, study, kitchen, hall, villa and parlor. Again another NICETOWN soundproof curtain in the Top 10 Best Soundproofing or soundproof curtain. NICETOWN is so good and that is why their products are the best and stand out from the crowd. 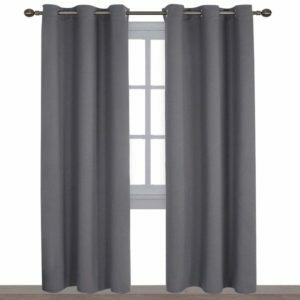 This curtain is good but it’s more of a Blackout specialized curtain than soundproofing, but for this price range it is really good and I would definitely recommend it if it fits your budget. This curtain has multiple color variants, not just two or three but 15 different color options such as Baby Pink, Beige, Black, Blue, Burgundy Red, Cappuccino, Fresh Green, Gray, Greyish White, Greyish Blue, Olive, Pure White, Royal Purple, Toffee Brown and Turquoise. This curtain is again made up of 100% Polyester, just as the other curtains from NICETOWN. 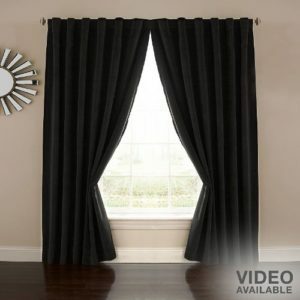 When you buy this curtain you get a set that includes 2 BLACKOUT PANELS of 42″ wide x 84″ length with 6 grommets top each. This curtain blocks 82-95% of lights and 100% sounds from the external sources. This curtain is also thermal padded so it is very energy efficient and help you save money on electricity. This curtain can be machine washed but dried only manually but not using a dryer to dry it. This is a really good soundproof curtain which is also energy efficient and best for the money. This is a budget soundproof curtain from a brand called Warm Home Designs. This is a really good soundproof and also blackout curtain for the budget price range. 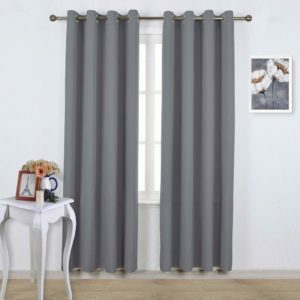 These color variants in this curtains are very less, there are only five different color variants such as Burgundy Red, Charcoal, Grey, Ivory and Teal Blue. This Warm Home Designs soundproof curtain provides 100% Soundproof for peaceful sleeping but only 95% blackout from external lights. But you find a decent soundproof curtain within this price range. It is machine washable so maintenance is not that difficult. This is the new brand in the listing called Flamingo P. This is a pretty decent soundproof curtain but the reason for their ninth position is because of the pricing. It is priced way too much which is not up to the price. But there is a reason for its pricing. This curtain is made using 100% polyester almost like NICETOWN Curtains. The package includes 2 Panel per package, Each panel measures 52″ W x 84″ L | Set measures 104″ W x 84″ L. It comes eight different color variants such as Brown, Cardinal, Grey, Indigo Plum, Navy, Pure White, Wheat and the classic white. The curtain is also layered with a material called Faux Silk thermal insulated blackout fabric. This fabric is known for blackouts Sunlight and other external light sources like Street Light or Vehicle Lights. This curtain is also energy efficient because of the thermal insulation. This is our final and last position on the ranking of the Best Soundproof Curtains. This is a soundproof curtain from the company called Absolute Zero. 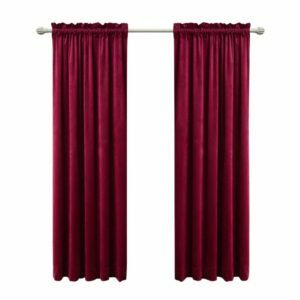 This curtain is specialized for homes that have Home Theater so if you have a home theater in your place then you can go ahead and order this one. This curtain is made up of 100% polyester and said to be 100% Blackout and also super soundproof. There are only four different types of color variants such as Black, Cafe, Chocolate and Stone Blue. It is machine washable so easy to take care of or maintain. It is layered with double thermal layers so a complete privacy and also energy saving is high priority. Finally, this 2k+ words article is completely over. We tried our best to provide value to you. We used these curtains for a while and came up with our review. These are the best soundproof curtains that we found and hopefully, it will be of huge value to you guys. If you have any doubts then please do comment below. Thank You. This site is owned and operated by GetSoundProofing. GetSoundProofing is a participant in the Amazon Services LLC Associates Program, an affiliate advertising program designed to provide a means for sites to earn advertising fees by advertising and linking to Amazon.com. GetSoundProofing also participates in affiliate programs with B&H, Adorama, Clickbank, CJ, and other affiliate sites.